Soneva Jani Maldives Located on the island of Medhufaru in a 5.6 km lagoon in the Noonu Atoll, Soneva Jani features both over water and island villas. 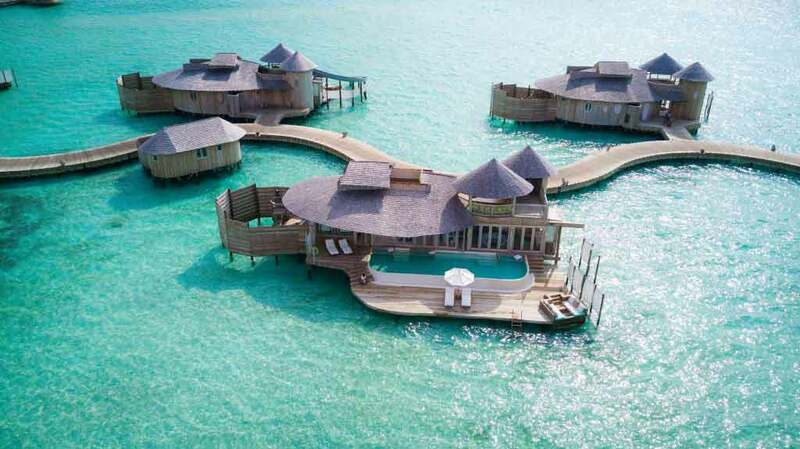 Each water villa opens to its very own stretch of lagoon and is complete with a private pool and a retractable roof to stargaze from the master bedroom. 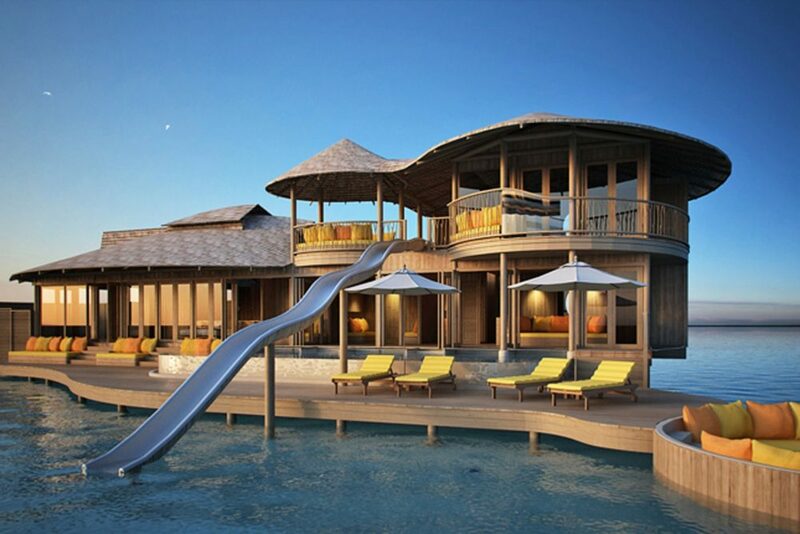 Some of the villas have slides from the top floor directly into the lagoon below. With beautifully designed interiors made from sustainable materials, all villas are equipped with a spacious master bedroom with an adjoining kid sleeping area. 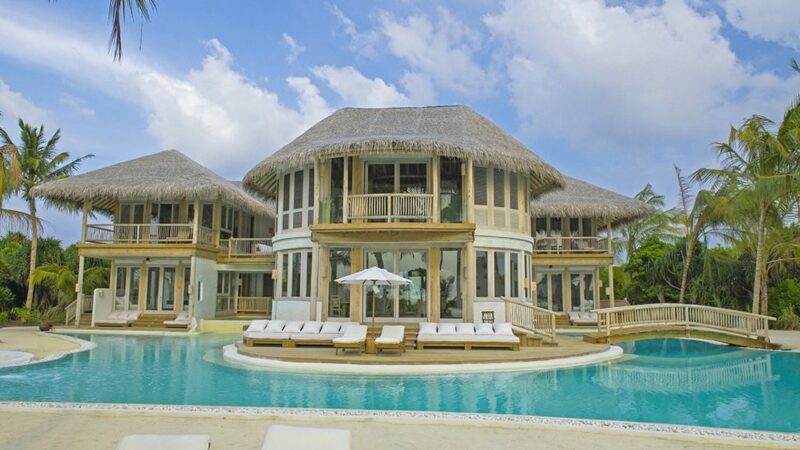 All villas have an open-air bathroom with bathtub, shower, and lagoon access. They also have a walk-in mini-bar with espresso machine and private wine cellar selection. An outdoor deck and seating area with sun loungers and direct access to the lagoon are also available. One of the most luxurious Resort for your Dream Holidays in Maldives. 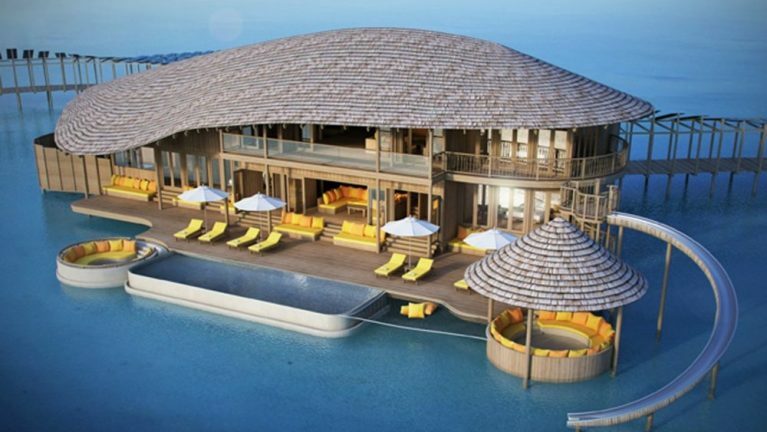 The main facility of Soneva Jani Maldives is located at the Gathering, which is a three-storey structure. That hosts the main dining outlets as well as an Observatory, a Spa, gift-shop and a water sports and dive center. There is also an over water silent cinema, a tennis court, a labyrinth gardens, an Eco-Centro and a Children’s Den on the main island. 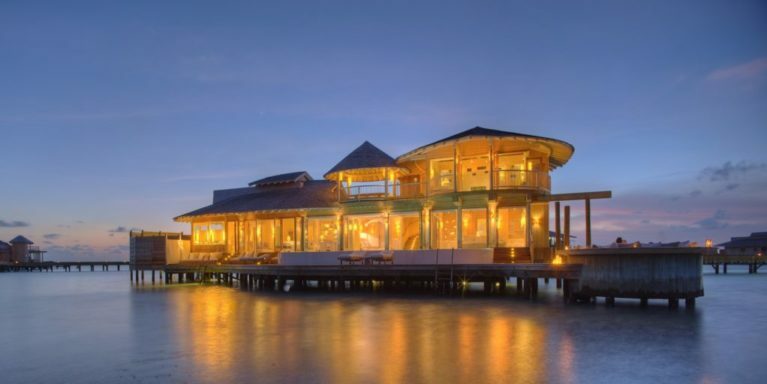 Soneva Jani Maldives offers a number of dining options and cuisines, as well as the complimentary cheese room, chocolate room and ice-cream room for all guests. 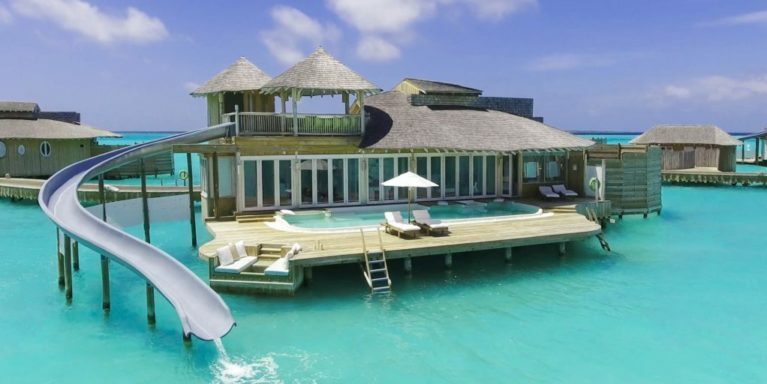 Regarded as one of the Top Ten Resorts in Maldives. 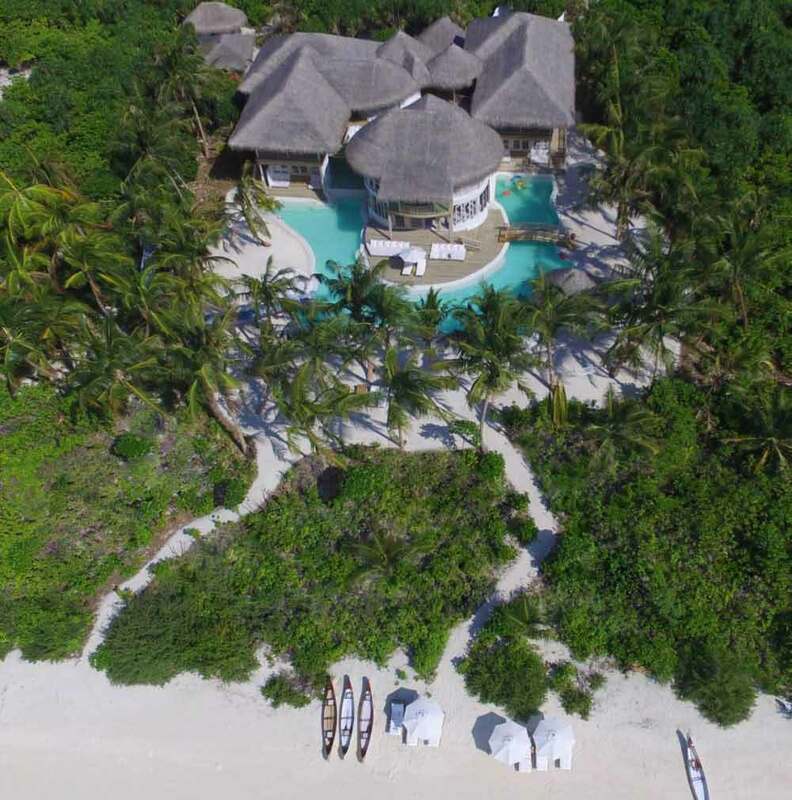 The property is a 40-minute seaplane ride from Male International Airport and 1-hour by speedboat from Soneva Fushi, Soneva Jani’s sister resort. Resort can also be reached by 20 Minutes Domestic Air transfer followed by an Hour's Speedboat ride. Book for minimum 07 Nights and receive 28% Discount on Room Rates. Book for minimum 04 Nights and receive 25% Discount on Room Rates. 28% discount applies for bookings with minimum 7 Night stays only. 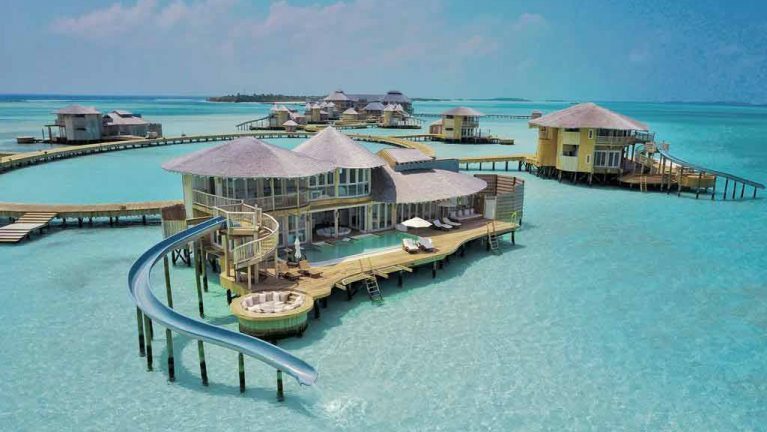 * Soneva Jani Maldives - Over Water Bedrooms with Slide. * Arrival & Departure Assistance at the Male International Airport. One Bedroom Water Retreat spread crosswise over two storeys, the One Bedroom Water Retreat accompanies its own particular private pool encompassed by sufficient areas for sunbathing and taking in sea vistas. Even more an extensive master bedroom and a children’s dozing area, there is additionally a study, stroll in minibar, bathroom, dressing area, outdoor shower, and living area with sunken seats ideal for relaxing. Head upstairs for more seating and a dining sala with rooftop deck and a curved water slide conveying you to the waters beneath. 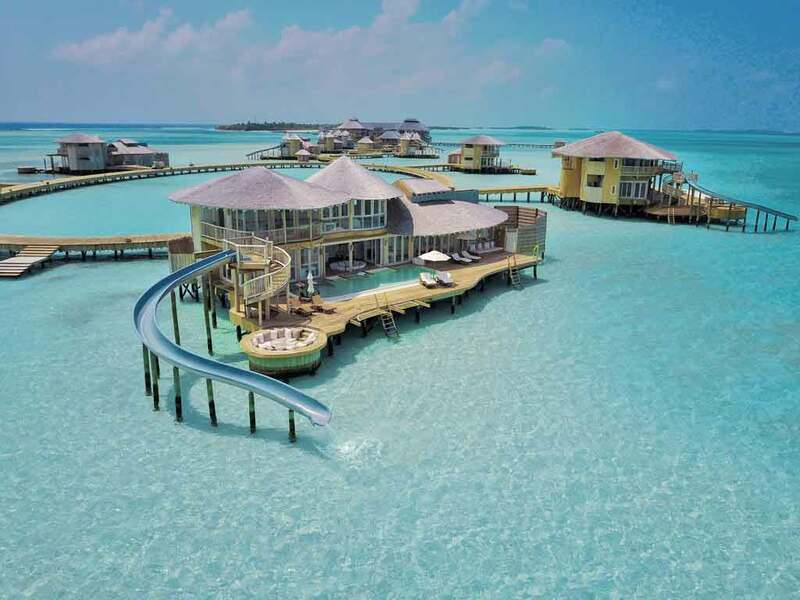 One Bedroom Water Retreat with Slide spread crosswise over two storeys, the One Bedroom Water Retreat with Slide accompanies its own particular private pool encompassed by sufficient areas for sunbathing and taking in sea vistas. Even more an extensive master bedroom and a children’s dozing area, there is additionally a study, stroll in minibar, bathroom, dressing area, outdoor shower, and living area with sunken seats ideal for relaxing. Head upstairs for more seating and a dining sala with rooftop deck and a curved water slide conveying you to the waters beneath. Two Bedroom Water Retreat with a private pool, catamaran net, sunken seat and daybed. The Two Bedroom Water Retreat bears an abundance of tropical relaxing facilities. The main floor offers a large bedroom, washroom, dressing area, outdoor shower, stroll in minibar, TV parlor and children’s sleeping area. The second floor is situated on the upper floor, alongside an extra dressing area, washroom, seating area, dining sala with rooftop deck. 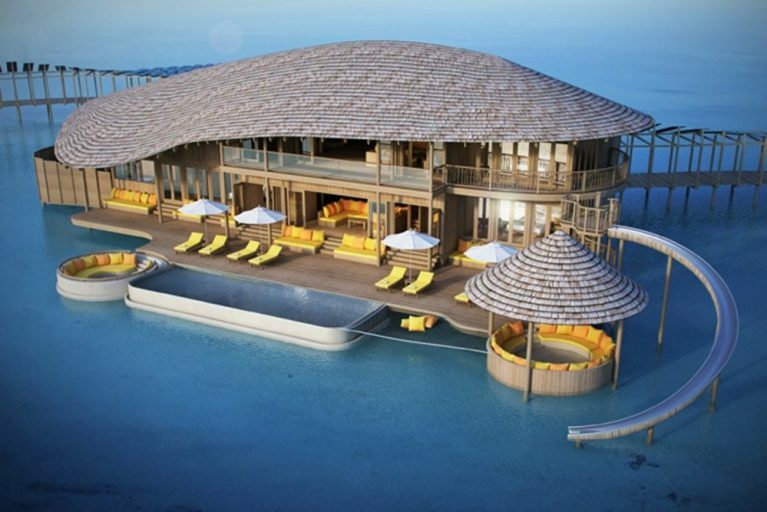 Maldives private Villas, Maldives Private Residences. Two Bedroom Water Retreat With Slide – With a pool, catamaran net, sunken seats and daybed, the Two Bedroom Water Retreat with Slide affords a wealth of tropical lounging opportunities. The first floor offers a spacious bedroom with retractable roof, bathroom, dressing room, outdoor shower, walk-in minibar, TV lounge and childrens’ sleeping area. The second bedroom is located on the upper floor, along with an additional dressing room, bathroom, seating area, water slide, and a dining sala with roof deck. 3 Bedroom Water Reserve with Slide to look over the tropical sun or the cooler shade with two open air sunken seats, one ensured with a gazebo rooftop. The lower floor offers a master bedroom with dressing area, study room, bathroom, pool and catamaran net, open air shower and daybed, stroll in minibar and a sleeping area for children and an en-suite guest room. Approach to the second floor for one more bedroom, a bathroom, dressing area, seating zone, dining sala with rooftop deck, water slide and stunning vistas out to ocean. 4 Bedroom Water Reserve with Slide is an over-water living at its finest, with a tremendous 1,066 square meters of luxurious living space and uninhabited perspectives toward each ways. This enormous villa features three private bedrooms, in addition to study room, a fitness room, an outside shower and daybed, TV lounge, stroll in minibar and a sleeping area for the children. And in addition a water slide from the top deck into the tidal lagoon beneath. 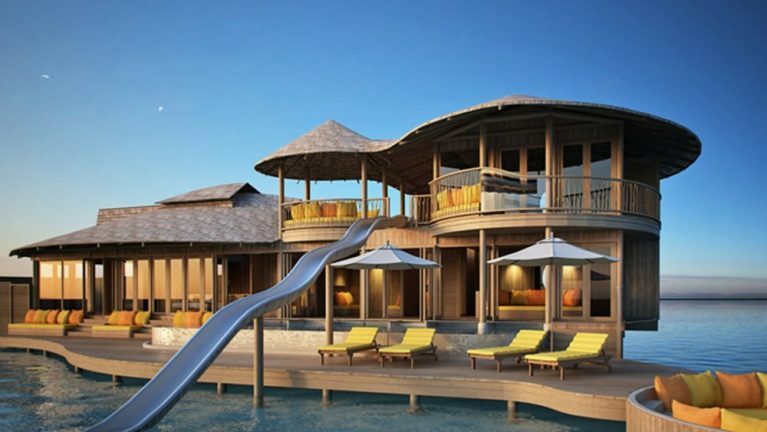 4 Bedroom Island Reserve with Slide is a spacious beachfront suite. The 4 Bedroom Island Reserve bears an abundance of luxury while taking into consideration individual customization relying upon your prerequisites. Roomy indoor-open air living areas, including a steam shower, changing room, sauna, master bedroom, TV lounge, dining room, private pool, kitchen and wine cellar. The second floor is home to a further three bedrooms with bathroom and dressing area. The Gathering The core of the resort, the Gathering is a three-storey over water structure that is home to different dining outlets, and additionally the spa, library, retail zone and wine cellar. It is situated beside the Observatory. So Fresh The day starts here with a perpetual spread of crisp natural products, ameliorating works of art and expressive energies from Juice Bar. The day proceeds with an abundant buffet of organic garden salads of mixed greens and live cooking stations with the wood burning pizza stove, tandoors and grills with bespoke pizzas and freshly caught and grilled to order fish. So Imaginative Trick your brain and taste buds with culinary science inside So Imaginative, Soneva’s trial tasting room. The sommeliers make enlivened wine testings and wine dinners, choosing the ideal pairings from the wine cellar. So Engaging Chefs table offering a secret menu for 5 extremely special guests. At Deckadence and Starlight table, dine under the stars where you can look over any of the menus the Chef is creating, or try a definitive stargazing supper at So Starstruck. So Starstruck With just four dining tables, all of which are connected to screens connected with the telescope, dinner at so Starstruck is really ‘out of this world’ experience and is not to be missed. The Gathering Bar Enjoy invigorating coolers, cocktails and tapas; whatever time of the day at the daybeds and over water catamaran nets overlooking the sparkling waters and the amazing sunset. The Gathering Wine Cellar Housed in with the extraordinary wine tower inside the Gathering, the Wine Cellar features mostly organic or bio-dynamic wines. Zuhairs Island Tucked away on the confined North Island, set in the tidal lagoon near the Water Villas is an ideal spot for swimming, snorkeling and time in the sun. Enjoy a delightful lunch on private shoreline, arranged by the culinary specialist using a fresh catch or pick. Cinema Paradiso An over water, outdoor cinema situated in a quiet cove towards the south of the island. Chef’s will arrange an ideal menu to go with the evening’s cinema time. Premium Luxury Resort with only 25 Units of Water Retreats. 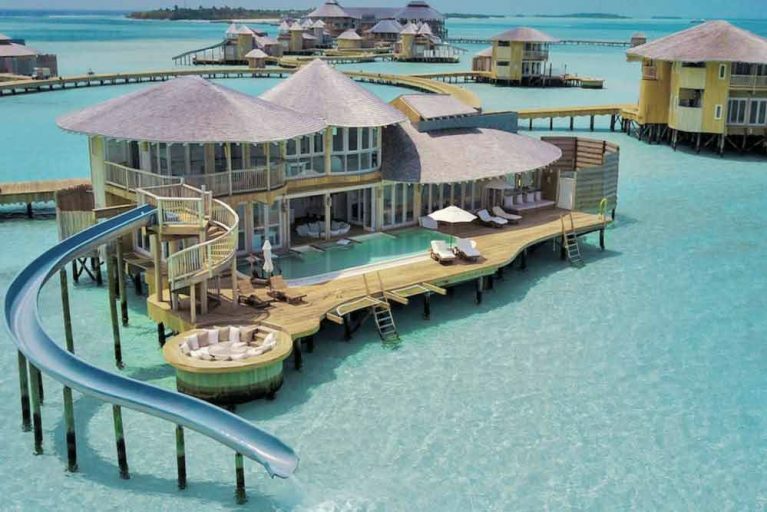 Soneva Jani Maldives has over 5.6 kilometers of Private Lagoon. Over Water Private Residences with Water Slides.